FOTM reader and regular commenter, Lophatt, has closely followed the narrative and players of the Parkland school shooting. In this guest post, with his usual wry humor, he takes a broader view of the shooting by placing it in its proper context. On February 14, 2018 we are told that the latest in an ever-growing line of “Lone Nut School Shooters”, Nikolas Cruz, entered Marjory Stoneman Douglas High School in Parkland, Florida, and began shooting, ultimately killing 17 and wounding 16. At 2:23 P.M., the school’s Resource Officer, Scot[sic] Peterson, is said to have radioed what he first described as “maybe firecrackers” and later determined to be gunfire. The shooter, Cruz, is said to have arrived at Building 12 (1200) at the school via Uber at 2:19 P.M. and began firing 15 seconds later. At 2:22 P.M., a fire alarm was reportedly tripped. Cruz is said to have stopped shooting at 2:27 P.M., a full six minutes after he began. All of the shooting appears to have occurred at Bldg. 12, judging from the official statements. At 2:23 P.M. Officer Peterson radioed that shots were fired. By 2:27 P.M. we are told that Cruz ditched his AR-15 somewhere in the building and exited, blending in with the crowd of students. We were further informed that he proceeded to a local sandwich shop where he ate a sandwich and drank a soda. At some point in the melee Officer Peterson, having not entered the building, radioed for other officers to remain 500 feet distant from the structure. Eventually entry was attempted at Building 1300 by Coral Springs’ Officers but the building was found to be locked. From the official narrative it appears that the shooting was complete by the time any officers entered the structure. As we’ve come to expect with these operations a cast of characters began to take form, along with the official storyline. As usual the “first-hand witnesses” and “victims” soon congealed into a small pool of would be anti-gun spokespeople. 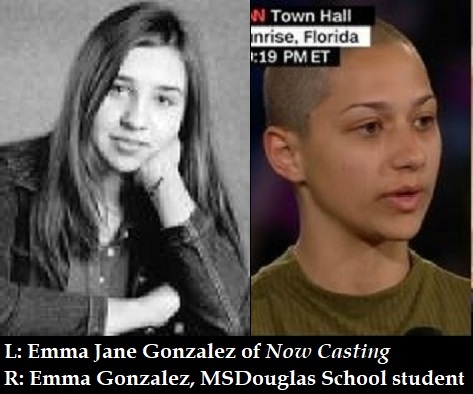 This core cadre of Enemies of the Second Amendment soon found their voice in the persons of two particularly notable specimens, one David Hogg and his female Sancho Panza, Emma Gonzales. Hogg quickly morphed into a ham with his closet rendition of Shakespeare’s Henry V, Act IV, St. Crispin’s Day speech that was alleged to be his spontaneous narration to his fellow captives, while under fire in the one of the school’s classrooms. This ‘spontaneous’ extemporaneous outpouring of outrage over the fact that civil disarmament could have prevented this tragedy, even then unfolding, was a clarion call to the strong of stomach and weak of mind. Besides the usual visual composition of the characters, Emma being a buzz-cut Hispanic, “butch” girl, and David being a particularly angry looking skinny male with no jaw, the message was the same as we’ve seen many times now. The obviously fully-funded operation resulted in trips to Dubai (! ), Washington D.C., and even meetings with the President and members of Congress. The purpose, naturally, was disarmament of the civilian population. As has been the case in all of these events, inconsistencies soon began to surface. Suspicious affiliations were identified among the key players and other witnesses had differing tales. Soon the “media” began to take down videos that contradicted the official story. Other students who were not in agreement with the prime directive were not allowed to have their say. As it turns out, David Hogg’s father, Kevin, is a retired FBI agent who currently works for a defense contractor that makes specialized targeting systems. His mother works for a CNN affiliate. While some of the characters are more difficult to trace, it soon becomes clear that they are steeped in Democrat politics and leftist myths. There have by now been several articles written on various aspects of this production. Rather than belabor the work of others, I think a focus on the meme itself is in order. While these deviate from each other slightly in their particulars, the overall pattern remains remarkably consistent. We have the lone male shooter. Always with what is loosely referred to as an “assault rifle”, usually an AR-15. Normally the shooter (patsy? ), is killed or takes his own life. Always there is high loss of life and miraculous recoveries among the wounded. The victims and their families are recruited to join the movement to “reform” gun laws. It is touted that, somehow, these measures will ensure that these events are a thing of the past. In watching this one develop I couldn’t help but be struck by how we’ve now been culled into roughly two camps. Those who think “news” is a “faith-based” undertaking and that the default position should always be mandated belief, and those who see these for what they are, frauds perpetrated on the public. It is easy to get derailed into endless debates about whether any were killed, or how many, etc., but, at the end of the day, these are frauds. They are created to soften up the population for the results of planned legislation. The certain hope is that the victims of this frauds, namely us, will actually demand the actions sought. It is difficult for me to understand someone who would be willing to participate in lies of this magnitude. Obviously they exist. Sandy Hook had its cast, Parkland has one as well. I have to admit to feeling some glee when I read that others are as repulsed by Parkland’s Hogg as I am. One can only hope that, due to his age, he finds honest work at some point in his life. Perhaps folding towels in a bordello. I have clicked on several of the referenced posts only to receive the message “NOT FOUND”.